This is a scheduled post. At the time this is up in this site, I am somewhere out there, sightseeing with friends in Monte Carlo in Monaco, some parts of Italy and France particularly in Cannes and Nice. This is Paris, one of the luxury hotels in Las Vegas. Sometimes, I am asking myself, when I can probably make some overnights in this kind of accommodation. Who knows somebody out there might treat me or maybe one of these days, I will win in the lottery. I am only kidding folks! I am quite happy and contented that one of my wildest dreams came true, and that is visiting the so-called "entertainment and gambling capital of the world." 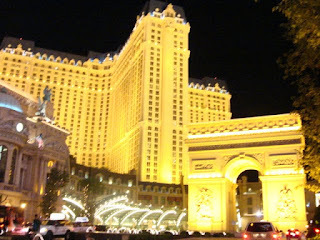 The Arc de Triomphe or the Arch of Triumph in front of Paris Hotel and Casino. I don't have a view here of the Eiffel Tower. You can browse at my Travel and Discover USA for a replica image of Eiffel Tower.